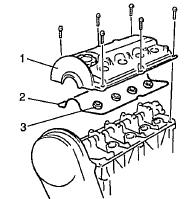 A. Cylinder Head Cover Removal. 1. Remove the negative battery cable. 2. 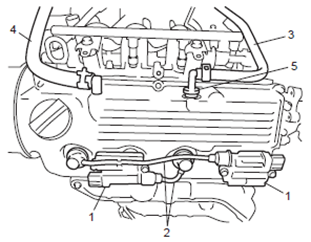 Remove the ignition coil assy. with the spark plugs wires. 4. 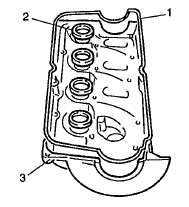 Remove the cylinder head cover (1) with the cylinder head cover gasket (2) and O-ring (3). B. Cylinder Head Cover Installation. 1. Replace O-ring (2) new and new cylinder head cover gasket (1) to the cylinder head cover (3). NOTE: Check each component of the change or replace damaged before installation and if found any damage. 2. 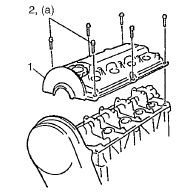 Install the cylinder head cover (1) to the cylinder head and tighten the cover bolts (2) according to specifications. 3. Install the ignition coil assy. 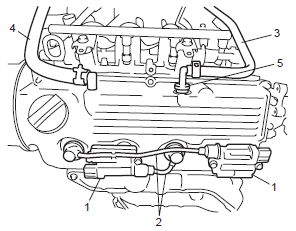 (1) with the spark plugs cable (2). 4. Install the PCV valve hose (3) to the PCV valve (5). 5. Connect the breather hose (4) to the head cover.